Started the second season how I finished the first. 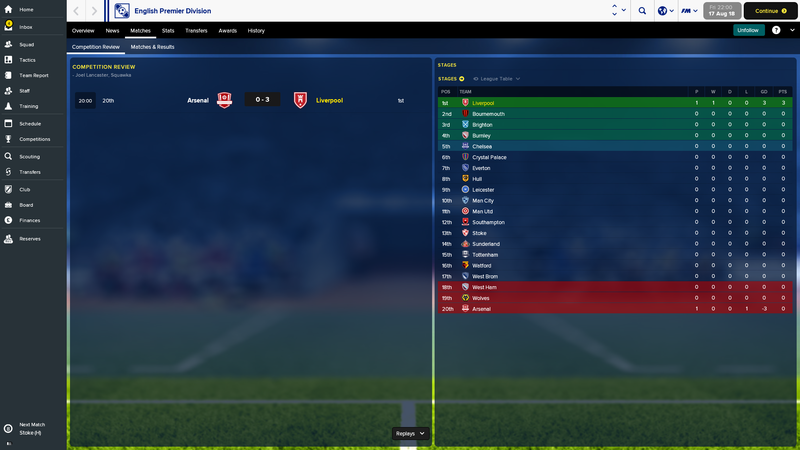 Beat united (who sent a fortune) 1-0 in the charity shield, won first 5 games in the prem, and smashed Porto 4-0 in the champs league. Kane has 6 so far. What sort of prices are you getting for selling and buying players ? Sold Lovren for 30m to PSG so far. 1st season for me started so well, went clear at the top by 9 points and then hit a mid seasons slump where City came out and won the league, made the final of the champs league but lost to United! got my new computer finally, so hoping to start a new save tonight (if the kids behave). has anyone used a tactic similar to Klopp's main tactic (i.e 3 in central mid with the 2 inside forwards in mane/salah & firminho up top) or are we all using the AMC position with 2 in the midfield? I am using a tactic similar to Klopp with 2 wide, one F9 a BWM and B2B midfielders and a half back. So far it crushes, but has trouble with teams with 5 at the back. So I need to figure out how to go around it. yet another question - how do you all use shortlists? Normally I add all the best players to it - but then my inbox gets clogged up with bids etc. and this is not accurate to real life. I'm starting to re-evaluate how I use them and may just add players I'm genuinely interested in buying to it? I keep a few different shortlists. One is for wonderkids and exceptionally good young players. Another shortlist is one I downloaded that lists bargain players you can get for cheap if you need a replacement due to injury or what not. Finally I have a shortlist of players I'm targeting in the next transfer window. Would not consider disabling Brexit personally as it will happen we just don’t know at the moment what that will mean. i am just starting third season and it is coming in and I can only have 17 non UK citizens in my squad but have not got to registration stage yet so do not know if this includes under 21’s or not. i need to trim the squad but because of the uncertainty don’t know exactly what to do at the moment. Lallana says hi ? Not one word about this fine player, guess you all disregard him in tjis version? Isnt he aint no good after his injury? what goalies do you ise that is immediatley better? Yikes, thanks - best of luck to you too! Not sure if you've got it tougher since RBL > Salzburg. Let us know how you get on. Subs: Mignolet, Gomez, Koulibaly, De Ligt, Clyne, Alexander-Arnold, Hendo, Goretzka, Timo Werner, Ox, Woodburn. How much did you sell Salah and Gini Wijnaldum for? And I'm guessing you got Goretzka on a free or I'm possibly wrong? Lallana is always injured and I still have him three seasons in but only a fringe player as for keepers Mignolet is still number one and has been brilliant but have Rajkovic as back up and then two fantastic potential regens that have come through the youth intake. Salah has been a bit part and unregistered for the league but I am going to give him a chance in season 3 but with Brexit kicked in it will be difficult. Wijnaldum went for £20M plus to Napoli and always had a shocker when we met in the champions league. My first season Champ League group was Real Madrid, PSG and RBL, group of death and I won it and went on to beat Spurs in the final. Excellent, Mingolet is good enough in the game? Thinking of starting a Liverpool save and the goalies would probably be the first ones to go. how do you set up your 2 Wide attackers? against 5 at the back you might need to change their roles and that of the F9. You definitely should try to get more out of him, been one of my best and most consistent players. 38(8) games in the first season with 17 goals, 5 asissts and avg. rating of 7.22. 25(5) matches in the second season, 18 goals, 6 asissts and avg. rating of 7.47. Playing him as an IF(a) on the right. Anyway, first season finished second 3 points behind chelsea. Crashed and burned out of the group stages of champions league, won the carapaow cup. Notable summer transfers in: Rugani, Diawara and Ángel Correa. Bought Malang Sarr and Özil in january, sold Bogdan and Klavan. 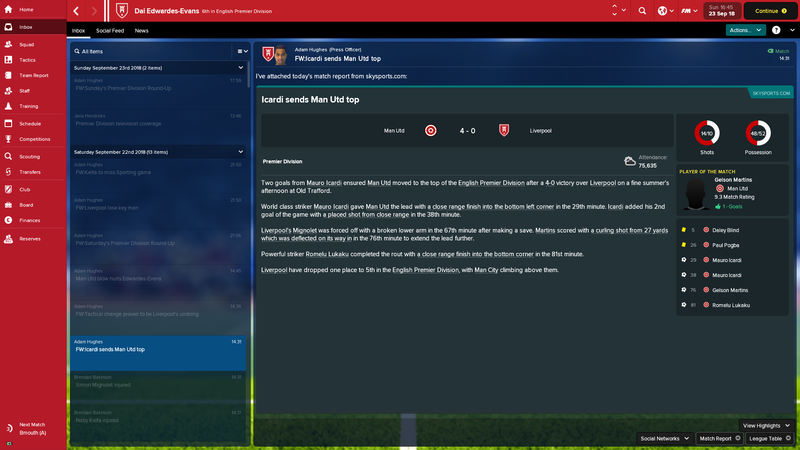 Won the league one point ahead of City and won the FA Cup in my second season. Lost on away goals vs Atletico in the semi finals of CL. Notable summer transfers in: Belotti, Donnarumma, Malcom and Laporte. 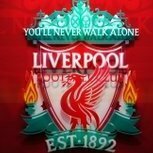 Out: Karius, Mignolet, Sturridge, Ings, Wijnaldum, Matip, Ox, Ward and Grujic. Also got £5.75m for Allan, £3.5m for Ejaria and £3m for Awoniyi. 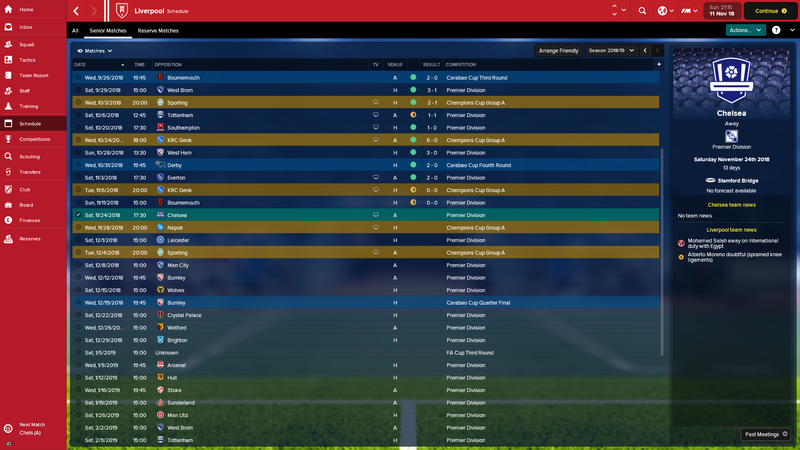 Signed some youngsters and tutors in january, best looking one is Abouchabaka from RBL for £4m + 800k. Other regular bench players getting decent amount of games: TAA, Lovren, Malcom, Özil, Firmino, Correa and Lallana. Gomez, Sarr, Grabara, Milner, Tobias Svendsen, Woodburn and Origi gets to play in most cup games. Haven't started on my transfers for my third season, but looking to move on a good number of players as my squad is rather bloated. Correa, Firmino, Lallana, Özil, Lovren and Origi are all in the danger zone. Haven't renewed Milners contract yet, but his wage demands are getting lower by the day so might keep him for backup/tutoring. I have coutinho on the left with Salah/Mane on the right. Yes, I get Goretzka free. 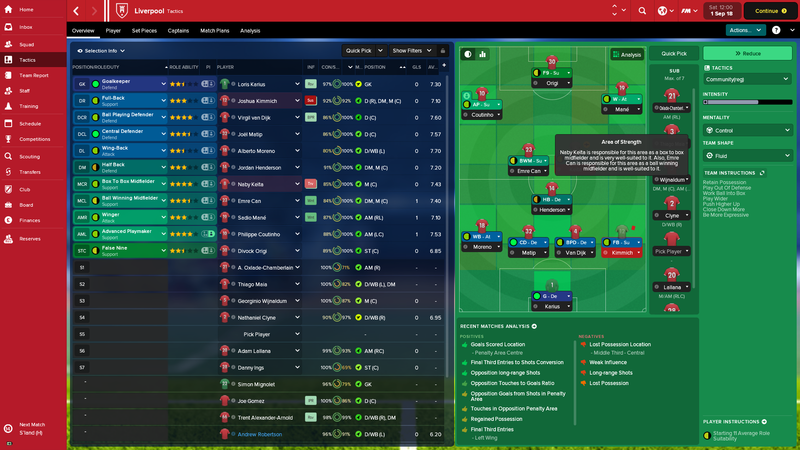 In the start of the season no.2, I have a squad overloaded with midfielders. Lallana, Coutinho, Seri, Keita, Hendo, Emre Can, Wijnaldum, William Carvalho, Goretzka and Grujic. I play with one DM and two MC's so I have 3 players fit to play at the DM position: Carvalho, Emre Can and Henderson. So I have at least 7 players to play at the CM. Coutinho is the star of the team, so he is my number 1 player at the AP(s) role in midfield trio. And there is a BBM role where Keita and Henderson is the best players for this role. I don't want to upset any of my players so I sell Lallana, Wijnaldum, Carvalho and Seri. Send Grujic on loan. I sold Salah start of the season 3. When I brought in Dybala, I don't want to bench Salah, also Barcelona and Real Madrid was monitoring him but never make a bid. So Zenit came to me with a £50M bid and I accept it. That's a lot of good money received from sold players! How'd you guys stop Sturridge from getting injured all the time? He got fit from the injury he starts with in the game and during an u23 game, he gets injured and is out for a couple of weeks again. and then I get this nonsense, I do so well leading up to this game and then they can't score at all. Anyone able to get a work permit for Rajkovic at the start of the first season? Rico Henry 12m loan back for season. A few im undecided on too. Dolberg. Would like him but have Firmino, Sturridge, Woodburn and Solanke for strikers. Also thinking of getting Pulisic for 30m. 18yrs so would be homegrown in 3 years and can play both wings. But have plenty of good wingers plus Wilson and Woodburn as youth backup. Then there is Arthur. Brazilian CM, all round awesome for 20m, but have plenty of good CMs atm. Though i may sell Wijn, Lallana, milner at end of season so he could be good investment, and send him back on loan for first season. Trying to get Rajkovic too, but cant get work permit yet. Tierney is main LB target, will get when hes available. Go after Dolberg. You can't count on Sturridge and Firmino to stay healthy the whole season. Especially Sturridge. I would agree with this. I decided I would need another striker and proven to be correct. Sturridge often injured and Solanke and Woodburn aren’t really ready yet. I paid Dries Mertens release clause. He’s 30 years old but worth it, and I know in 2 or 3 years hopefully Solanke and Woodburn will have developed. Let me know how you get a long with the deeper defense line. Debating whether I want to bring in Griezmann or Dybala. Griezmann fits best position-wise (and are more versatile), but he also want astronomical wages. He'd fit into strenghting that left-hand side, but if I go for Dybala, Coutinho can play more on the left. Really want Mbappe, but he's not interested. Who would you go for? Any one tried either (or both) on FM18? I would go for Dybala - younger and better. I would play him as ST instead of Belotti though. But that is just me. Jeez, Dolberg wants some wages doesnt he :/ 90k a week for a 19 year old. He sure does. I'm paying him roughly $4.3 million a year as a rotation player. But I've been playing the hell out of him because Sturridge can't be healthy for more then one game at a time. I'm in November of the first season and just got a message from my Head of Youth Development that Dolberg is now a starting caliber Premier League player, not a rotation piece. Dolberg is worth every penny. There should be, below, three shots of FM18 tactics. If not, please ignore and forgive my pc illiteracy. I would refer you to my post in the tactics forum of November 4th. From there I've advanced to these three tactics for FM18. The 4-1-4-1 contain tactic is plucked from the air, pure guesswork. 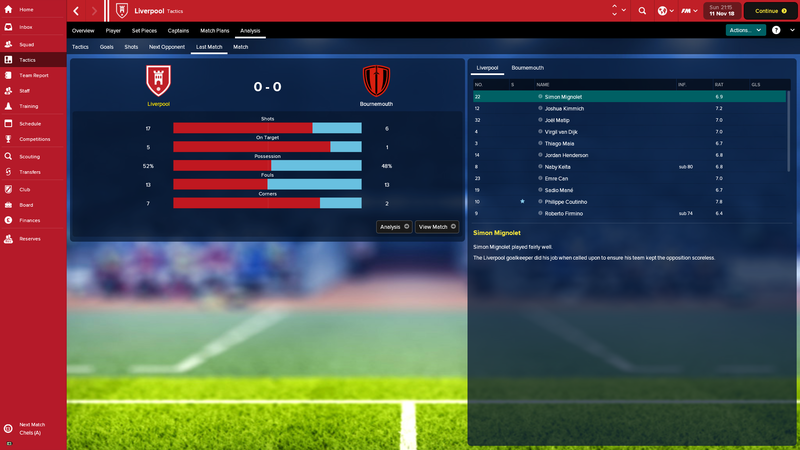 The other two are based upon the set of tactics in the FM18 masterclass sheet supplied with the game. Before I get into the start of the first game of the season I'm hoping that those of you 'wot' know better than me might offer up some assistance as to whether or not they will win all before or get relegated and therefore send me to the dole! The TI's are as is in the Masterclass sheet, mainly because I keep getting TI's wrong. The 4-3-3 set is how I think that Klopp was playing up to the recent Man. Utd game. Please refer to the November 4th post in the tactics forum. The 4-2-1-3 set is strictly a Masterclass sheet copy with the players roles/duties added by me. I confess to scouring all sorts of tactics from all over the websites to try and get some idea of how best to proceed. I'm desperately trying to avoid having to resort to one or more of the third party sets which will appear soon, I'm sure. Please, can someone show an old pensioner the way to enlightenment and to winning the League, of course? I realise I've not given much to go on but just trying to get these pictures up has taken about one hour. Muchly thankings. PS. PI's are totally as is and unaltered by me. Just can't seem to get Salah, Mane or Ox to play well for me at all unfortunately. Might just have to try only playing Salah or Mane one at a time on whichever wing. Play a 4231. May end up selling them at the end of the season if it continues this way. I can't win a game, lol..
My tactics are not working at all!! I'll offer my tactics to try to help with anyone struggling. I'm 12-2-1 in the EPL in the beginning of December, won all of my CL games in my group thus far (Dortmund twice, Shaktar twice and AIK once and about to play a meaningless game two) and made it to the quarter finals of the Carabao Cup thus far (not that this matters). Haven't played an FA Cup match yet. I play a 4-2-3-1 with Control and Flexible as my structure. My team instructions are: Retain Possesion, Play Out Of Defense, Run At Defense, Work Ball Into Box, Drop Deeper, Be More Expressive, Close Down Much More, Prevent Short GK Distribution and finally Get Stuck In. "Get Stuck In" is something I alter depending on the referee, the opposing team, and if I start getting a ton of fouls I'll remove it during the match. It's more a personal preference. Like I said, I've only lost one match (Chelsea 2-1 away) and I'm in December. This formation gives you flexibility with Couthinho, Firmino, Mane, Salah, and Ox. Many of them are interchangeable within all the AM position. All starting 11 of my players have average ratings at, or above, 7.4ish. I've won Manager of the Month all four months thus far. How does this possibly work? There’s only 2 players defending! Oops. Replied to the wrong one. Should have replied to this. Amazed this is successfull. Seems very unbalanced with essentially only two players defending. Can’t quite fathom your tactics either. Closing down much more which would suggest a higher line but your actually defending deeper. The fullbacks, even set to "attack", play defense just fine. I'm using a combination of Robertson/Moreno/Tierney (who I signed) on the LB and TAA/Clyne (who just came back from injury) on the RB. I also use one of the midfield spots for a guy like Can, Henderson, or Milner because they can play both sides of the pitch effectively. I"m 1st in goals scored and 3rd in goals allowed in the EPL. Made it out of the CL Group Stage undefeated and the top seed. I'll try to post some screenshots when I get home from work so you guys can see I'm not lying! How is your 4231 tactic set up? I play both as IF (A) too. Just seems as though they don't run with the ball or make any proper runs for some reason. I'll tinker about with the player instructions again and hopefully get it working as I like. Funnily enough though, I'm sitting top of the league, 1 point ahead, with 9 games gone.